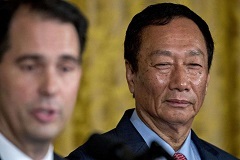 Walker's priorities are to spend billions on his wealthy elite donors and mega corporations like Foxconn to advance his own lifelong political career. MADISON - The following is a statement from the Democratic Party of Wisconsin's communications director Melanie Conklin on Gov. Scott Walker first ad buy in the highly competitive 2018 governor's race. "A panicked Scott Walker is out with an ad buy before Memorial Day attempting to cover up his years of fiscal mismanagement and neglect of our state. He desperately hopes we will forget that he has puts himself and his donors first while neglecting workers, education and infrastructure. "Walker's priorities are to spend billions on his wealthy elite donors, mega corporations like Foxconn to advance his own lifelong political career at the expense of the basic needs of our state, our small businesses and regular Wisconsinites."